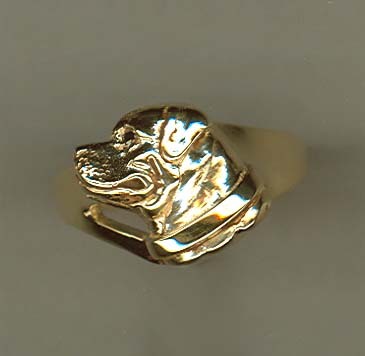 Breed Specific and The BEST and most REALISTIC on the market ! 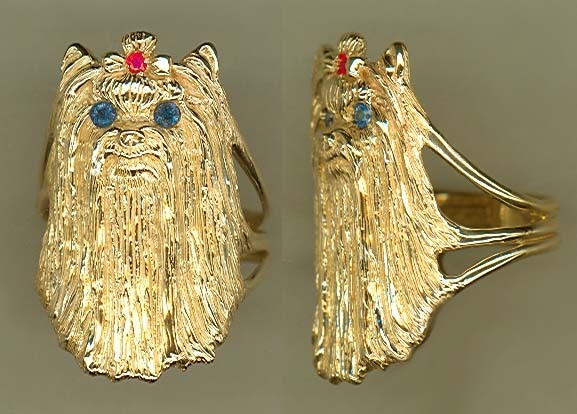 AVAILABLE WITH BLACK DIAMOND, OR SAPPHIRE EYES, INQUIRE. CLICK ON ANY PHOTO TO ENLARGE ! 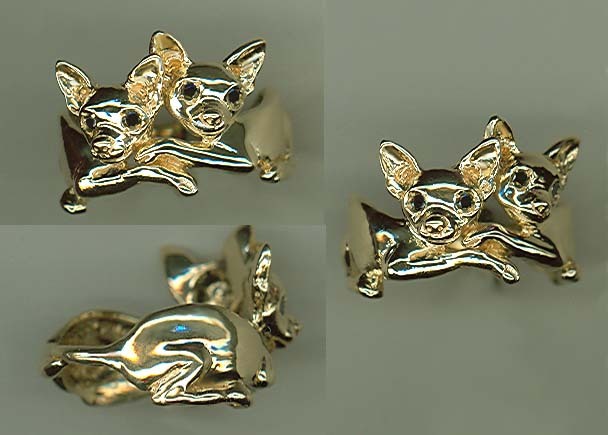 METICULOUSLY DETAILED, TWO DARLING CHIHUAHUAS' NESTLED TOGETHER WITH THEIR TAILS ENTWINED! CONSIDER ADDING BLACK DIAMOND EYES AS SHOWN!! 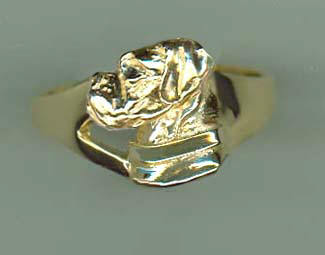 5/8"H - 14K SOLID GOLD...$729. NEW!! 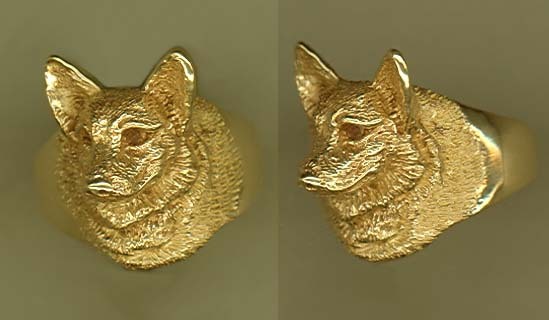 CORGI - CARDIGAN RING! 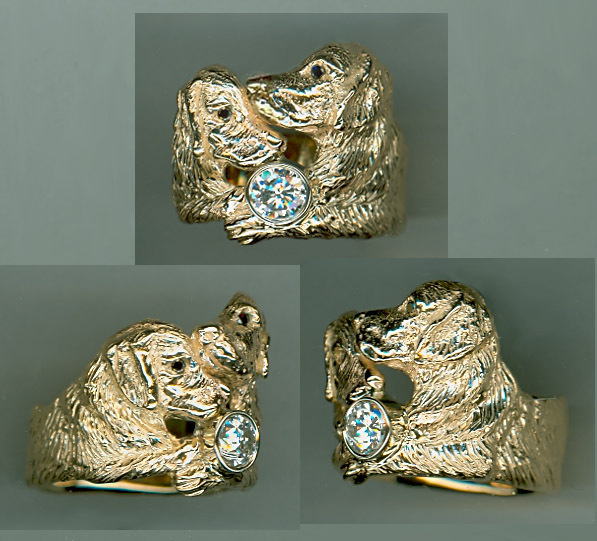 GOLDEN RETRIEVER - DOUBLE HEADS RING!! 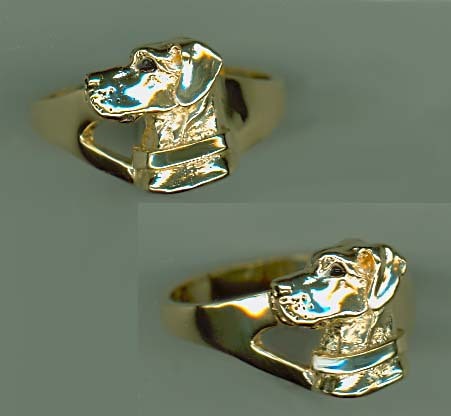 THE MOST BELOVED DOG, YOU CAN NEVER HAVE TOO MANY!! 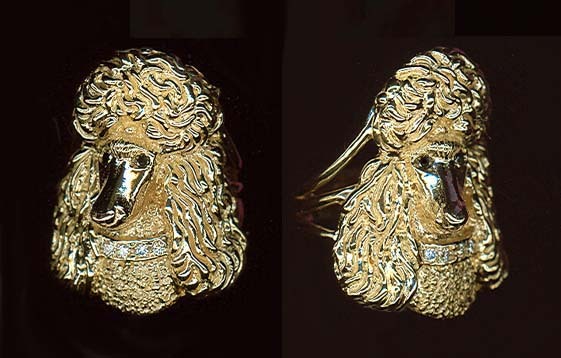 CENTER DIAMOND or BLACK DIAMOND EYES AVAILABLE - INQUIRE NEW!! 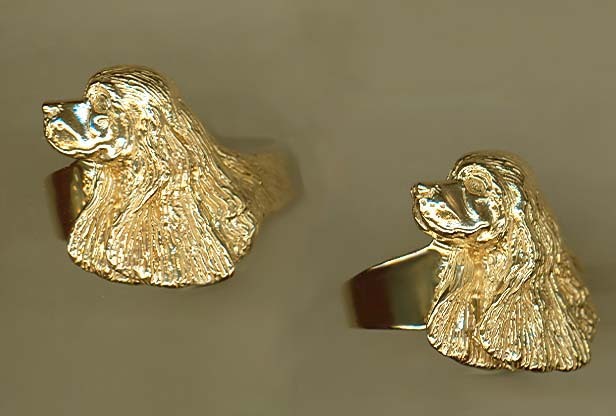 1 /2" H - 14K GOLD...$799. 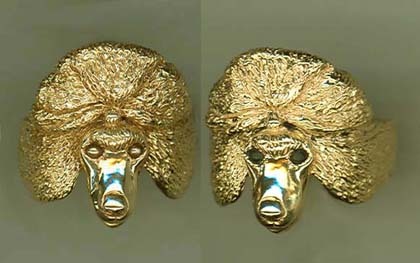 FABULOUS HEAD TO MATCH PENDANT ABOVE! EXTRA LARGE STUNNING SPAGHETTI CURL STYLE. If you love FLASH & BLING..This is it!! 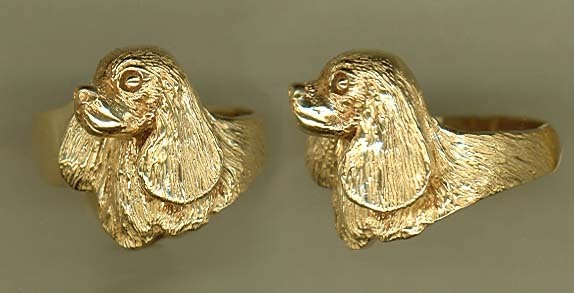 FABULOUS DETAIL WITH THE EARS WRAPPING AROUND THE FINGER! ABSOLUTELY FABULOUS! 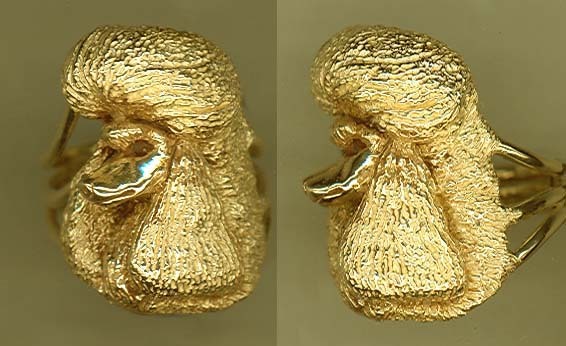 1 /2" H - 14K GOLD...$759. 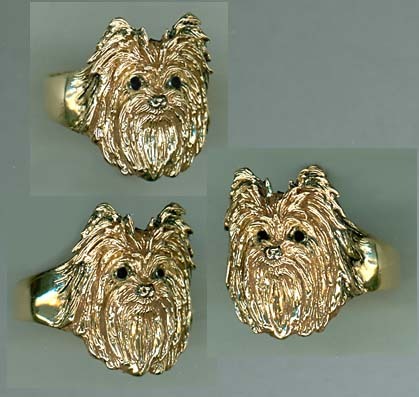 FABULOUS SCHNAUZER HEAD STUDY RING! 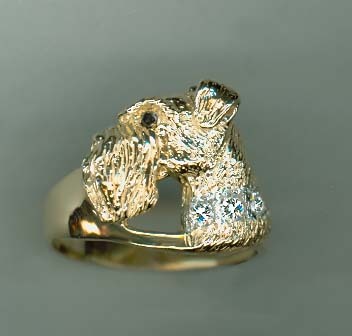 1/2" H - 14k Gold...$699. 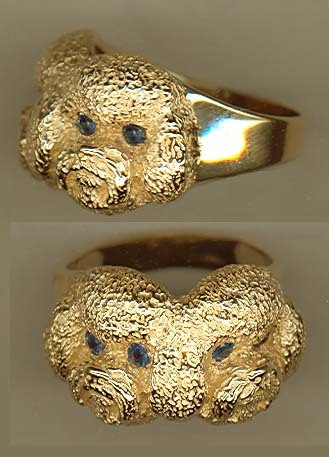 HEAD STUDY RING! 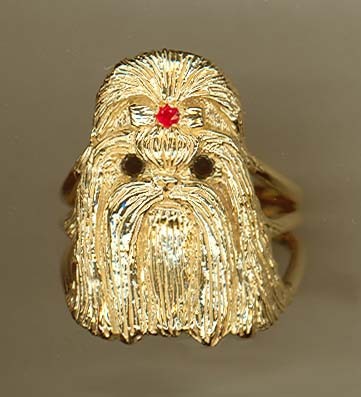 - THIS ONE HAS FABULOUS BLACK DIAMOND EYES AND THE RUBY TOP KNOT!! 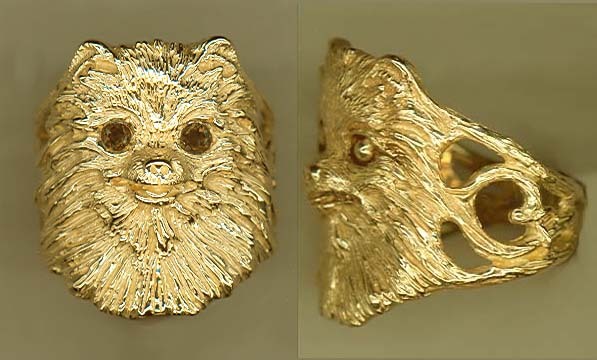 ITEM # SHIH 14R - 1"x3/4"
w/ Stone eyes, & Ruby..$1029. BLACK DIAMOND EYES AVAILABLE AS WELL! 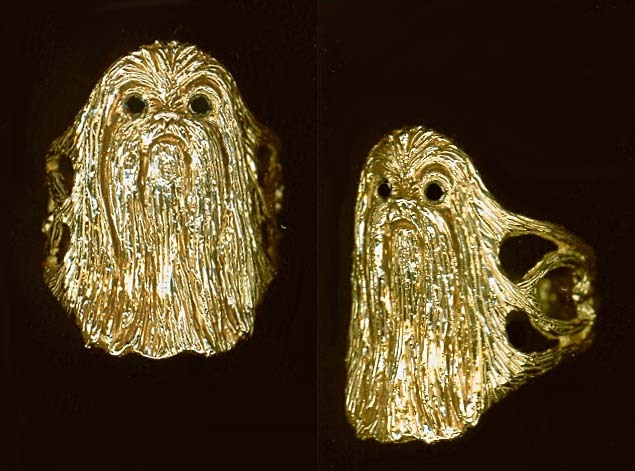 CAPTURED IN THE MOST DETAILED RING WE HAVE EVER DONE. 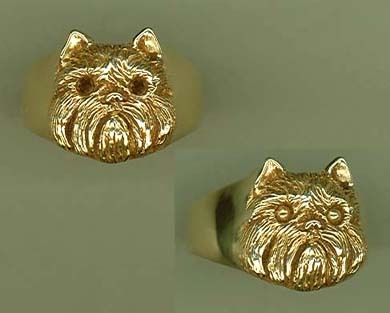 ALL THE LOVE FOR YOU TO LOOK AT ON YOUR FINGER EVERY DAY! WITH FINE BLACK DIAMOND EYES! 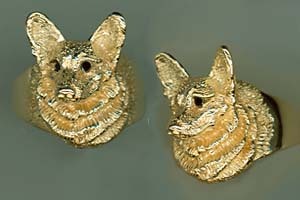 Antiqued gold on request!